Summer is officially here and it's time to bring on the salads! Pasta salad, green salad, noodle salad and, of course, rice salad. I envision a summer of stocking the fridge with neatly stacked clear containers full of all kinds of easy-to-make, healthy salads to grab on the go. Off to the beach? Have a sesame noodle salad at the ready. Pop it into a cooler with a refreshing spritzer, a variety of fruit and a batch of homemade Coconut Date Brownie Bites and you'll be ready for a picnic at the beach or park. Because, if you're anything like me, preparing for a day trip is all about the food! 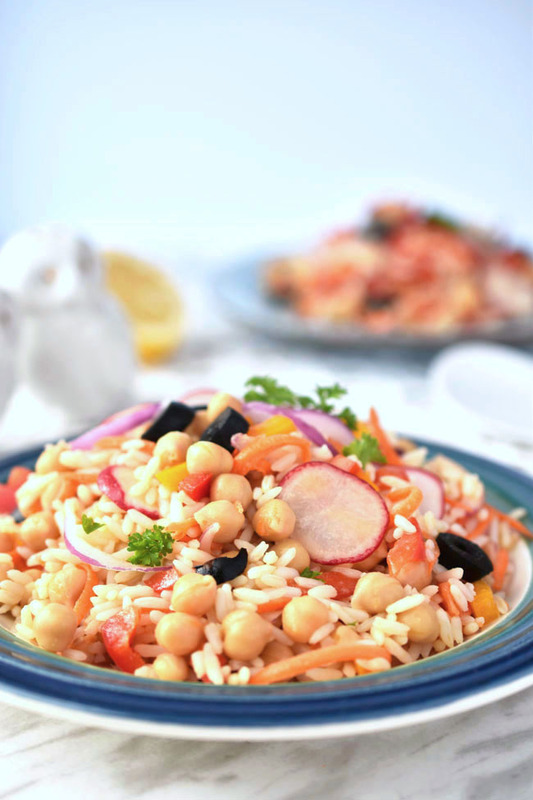 This Simple Summer Rice Salad is made with ingredients you're likely to have in fridge and pantry - because who wants to be out looking for complicated ingredients when you could be enjoying the summer sunshine, right? 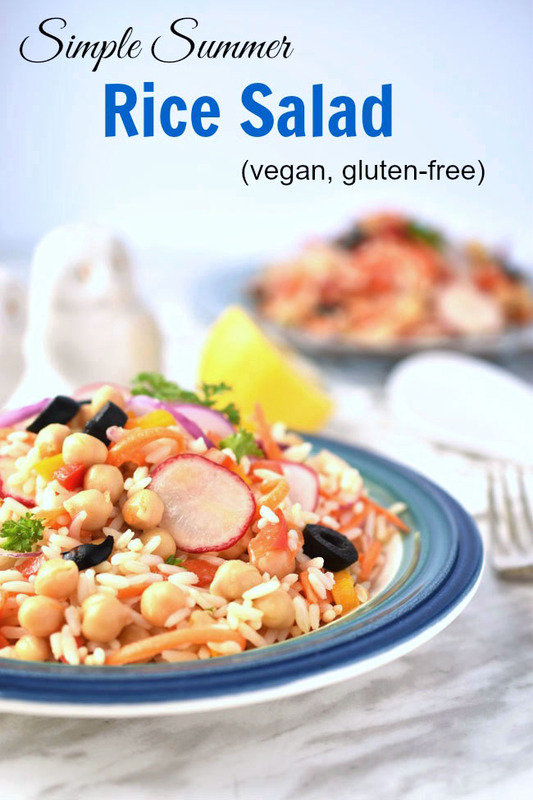 This rice salad is also naturally gluten-free and vegan. 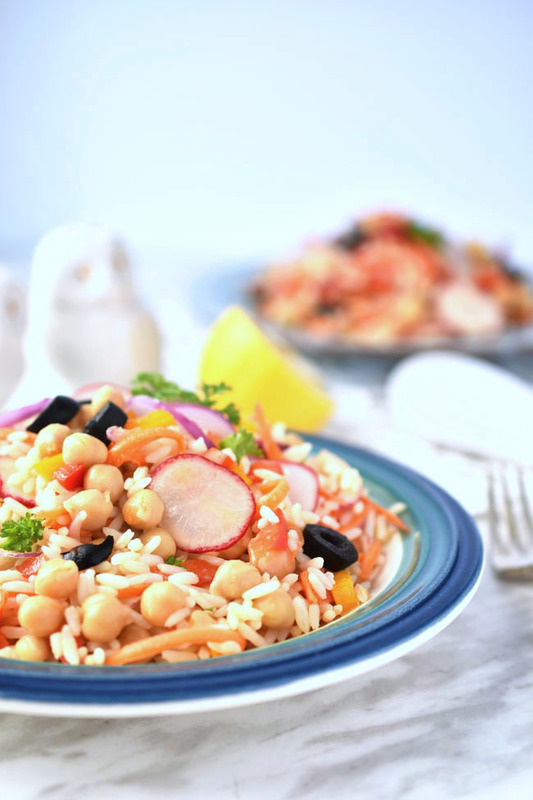 It boasts a tasty, nourishing combo of ingredients such as grated carrots, radishes, red onions, olives, peppers, chickpeas and fresh parsley. And rice of course. You'll also whip together a quick vinaigrette with apple cider vinegar, olive oil, Dijon mustard, freshly squeezed lemon juice, agave, garlic and salt. Like I said, nothing complex. Stir it all together and you have a simple, tasty rice salad that works well for a lunch entree or a dinner side. This rice salad also makes a great potluck contribution because it works for lots of folks, including your vegan, nut-free, soy-free and gluten-free folks. Bring along fresh, cut-up watermelon too for a tasty, healthy summer food combo. Take advantage of the fresh parsley in your garden or in that pot by the back door and garnish your rice salad with some lovely green parsley! Are you ready for summer salads? What is your fave type of salad? What kinds of foods do you like to pack for picnics? I'd love to hear your ideas. Put all ingredients in a large bowl and stir gently. Whisk all ingredients together in a measuring glass or small bowl. Pour over salad and stir gently. Make the rice a day ahead and store in the fridge until you're ready to make the salad.